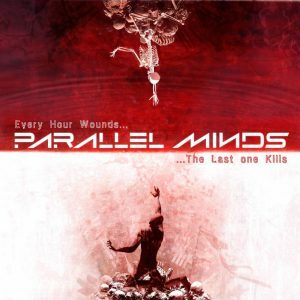 After their fantastic debut in 2015 with Headlong Disaster, the French power metal masters Parallel Mindsare back with their second CD, Every Hour Wounds… The Last One Kills. This is a potent mix of explosive solos, shredding thrash metal riffs, speed-of-light fast drums, emotional vocal work, clear melodies and engaging lyrics. Behind the curtain of heavy solos and aggressive vocals can be unveiled abundance of meticulously thought through harmonies, elaborate compositions and, generally, all the signs of true craftsmanship. For those who remember the album Parallel Minds(1993) by the Norwegian band Conception, there is an interesting association to be drawn here: not intentional, however very logical. There definitely are resemblances between the two bands, in terms of genre and its application, vocalists’ styles, etc. – but this is a different avenue to explore. The value of the French musicians’ work remains untouched by this parallel, as what they do is original and rather brilliant. What the band elaborated in an interview taken by the reviewer with regards to the debut CD is still true for the new release: “This album has everything, from thrash to ballad, through epic piece. All these elements are present in our all time favourite albums, like “Master of Puppets”, “Imaginations From the Other Side” or “Divine Wings of Tragedy”. This richness makes great albums”. The immediate association coming to mind when listening to the opening track ‘Every Hour Wounds’ is how this masterful song follows the composition scheme routinely and regularly employed by Symphony X. Being an instrumental track, it could easily lead you into the false conclusion that this is a new Symphony X’s project (think Paradise Lost opening with an instrumental), particularly bearing in mind the perfectionist solos, depth of the track, as well as the change in direction, speed and melody. As the case was in their debut albums, these guys will not bore you, not in their longer tracks either. They like to keep you interested with the depth of their compositions, and with melody, rhythm and pace regularly taking an unexpected direction. In terms of lyrical content, while in Headlong Disaster references were drawn to ancient history (Sparta, Babylon), this time around the attention is focused on modern days, with socially poignant tracks such as ‘Syria’, ‘Kolyma’ and ‘The 52 Hz Whale’ where lyrics are just as important as the music. Parallel Mind still look for the signs of history repeating itself in our world (calling Syria “present Mesopotamia”, for instance). The album is easy to follow and a pleasure to listen to. It features explosive speedy tracks (‘I Am C’ with its straight to the point bombastic intro and speedy ending) as well as songs with steady power metal pace (‘How’) and a fantastic ballad (‘On Your Own’). There is also the very typical and pretty addictive type of thrash-power metal (‘Kolyma’), and even a bit of Pink Floyd (again in ‘Kolyma’). The lead singer’s style is worth special noting. Steph’s voice is one of the factors that triggered comparisons with Savatage on the very onset of Parallel Minds’ appearance on heavy metal stage. They now officially include Savatage in their credits towards influences (alongside Symphony X and Nevermore), and have this time decided to include a Savatage cover (‘Tonight He Grins Again’) where it is a serious challenge to find the difference between the two vocalists. Another similarity to Savatage are the background choruses drawn in the same style (which can, however, be rough vocals as in ‘I Am C’ giving Parallel Minds their own signature stamp). However, there is much more to Parallel Minds’ vocal work than walking in the footsteps of the American legends. The singer likes to employ a range of techniques, from classical clear singing in Jon Oliva’s style to screaming (emotionally charged in ‘I Am C’) and aggressive recitative (‘How’). A masterpiece well worth finding and listening to. Good stuff Angie… a forensic review, and, “aggressive recitative”! Wow!